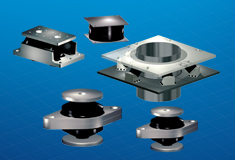 Oil States is a highly experienced supplier of engineered elastomeric bearing systems. Our designs are developed using proprietary methodologies that define the state of the art for laminated elastomeric bearings. Oil States elastomeric bearings are in service in numerous offshore systems, including turret support, top-of-column isolation, shock cells and fendering systems. Effective isolation of couple structures from dynamic shear loads and moment.